I drink a lot of tea. It’s kind of a passion of mine. 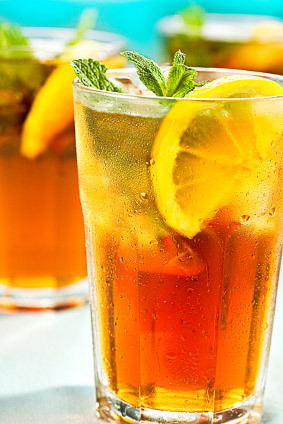 I love iced tea. But I’m a bit of a purist. It needs to be unsweetened so I can taste the tea. And it needs to be tea, Camellia sinensis, at its core. I don’t mind it mixed with other things but the flavor and character of the tea is what I crave in my glass. That being said, to say that Barnes & Watson Tahitian Blend Ice Tea is great would be a vast understatement. It goes above and beyond any other iced tea that I’ve found. The tea is delicate with hints of flowers and fruit. The flavor blossoms from the first initial splash into a solid back of the mouth flavor. It’s amazingly satisfying and distinctive, and contains the perfect blend of everything I could possibly hope for in an iced tea. I cannot recommend the Tahitian blend enough. It’s perfect; not bitter, refreshing, and great. I first had this at the four star hotel I worked at about 7 years back and it was the most amazing find, and one of the best things about working there. I have not found a better blend for iced tea since. It is my absolute favorite iced tea.